I have few material possessions that I would run into a burning house for. My guitars. My boxes of photographs. But above anything else that comes to mind is the necklace and teacup charm that Mom gave to me. Originally it was given to her by a group of her friends that she met up with each Friday year after year for coffee at La Madeline. Occasionally I went with Mom to those Coffee Talks, and I know how meaningful those friendships were to her. 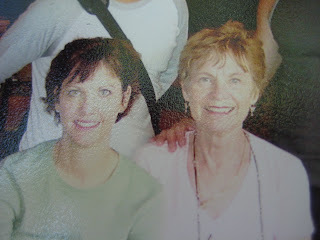 I felt so honored that Mom gave me that special necklace of hers that she wore everyday since it had been given to her. I don't wear it everyday because for one, I don't usually wear gold. But I wear it a lot. And I find myself grabbing onto it often when it's around my neck. When it's not around my neck, I keep it in a very special container that is marked with the words, "Bless and keep all safe." Since it is Mother's Day weekend, I decided to get out my pictures of Mom. Of course, there are not of enough of them to satisfy me. But oh how I love looking at the ones I do have! I notice in most of the pictures, she's wearing that little charm necklace. I love that what she so often wore on her neck, I now wear on mine. And I'm in the middle, held by Mom. The night I got engaged to Fermin- Mom was perhaps as happy as I was! She loved Fermin! Joan was a wonderful and beautiful person and i miss her dearly.!!! 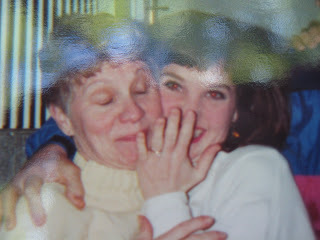 ahhh, I was thinking about her on Mother's Day and just wishing we could have brunch with her. Great pics......such a sweetie!!! I'm so glad you got that necklace!!!! I am so curious how left that first comment?! Anyway, thanks for leaving the comment-- She WAS beautiful! !